Site description: Panguitch Lake is situated at an elevation of 8,212 feet approximately 18 miles southwest of Panguitch, Utah. It covers 1,234 surface acres, holds 40,100 acre-feet of water, and has a maximum depth of 66 feet. The lake is the source of Panguitch Creek and is fed by three small inlet streams: Blue Springs Creek, Clear Creek, and Ipson Creek. 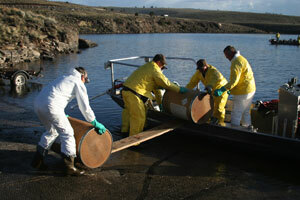 Panguitch Lake is one of southern Utah's most popular and productive fisheries. 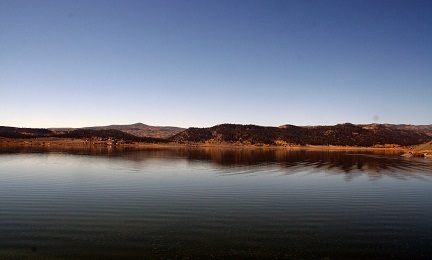 Panguitch Lake has historically been one of the most important sport fisheries in southern Utah. It has long maintained a reputation as one of the best trout producers in the state. The fishery has not been without problems, however. Competition between Utah chubs and stocked trout has been a chronic problem at the lake, with the trout fishery suffering when chub numbers are high. To address the chub problem, a new management plan was developed during 2005. The intent of the new plan was to maintain the family-type fishery that Pangutich Lake was famous for, yet implement actions that would address the problem of chubs in the future. Maintaining an average catch rate of 50 trout per net-night in annual trend nets. Maintaining at least 10 percent of the rainbow trout captured in annual trend nets as 2-year old or older fish (at least 15 inches in length). Increasing predator trout (Bear Lake Bonneville cutthroat trout and tiger trout) to 25 percent of total annual trend netting catch. Producing mean angler catch rates of at least 0.5 trout per hour. The first step of the plan was to remove the chubs (trout were removed as well) by a chemical treatment in the spring of 2006. Following the spring treatment, over 60,000 10-inch rainbow trout were stocked, as well as an additional 150,000 smaller rainbow trout. Cutthroat trout and tiger trout rounded out the 2006 stocking. Although biologists were hopeful that chubs were completely removed by the treatment, history has shown that they will eventually return to the lake. Consequently, additional measures were included in the new management plan to mitigate any impacts that chubs will have when they return. Species stocked will be different than in the past. The trout stocked in the lake include fish (Bear Lake cutthroat trout and tiger trout) that are better predators than rainbow trout and will feed on chubs and help keep their numbers in check. In order for this part of the plan to work, new regulations to maintain a population of the larger-sized predator trout will be necessary. The new management plan implemented special regulations intended to protect predator fish population. The goal is to have a enough predator fish to control the chub population, when chubs return. The original 2007 regulations introduced a slot that required trout between 15 and 22 inches to be released. The newly restored population of trout grew fast, which unfortunately meant that the majority of fish caught by anglers in 2008 were in the slot and could not be harvested. Since one of the management goals at Panguitch Lake is to provide anglers with fish that they can take home, the Utah Wildlife Board decided in fall 2008 to remove rainbow trout from the slot, while still protecting cutthroat and tiger trout. Effective beginning in 2009, the new regulations allow Panguitch anglers to keep four trout, only two can be cutthroat or tiger trout under 15 inches and only one can be a cutthroat or tiger trout over 22 inches. All cutthroat and tiger trout between 15 and 22 inches must be released. There is no restriction on the size of rainbow trout that may be kept. Because rainbow and cutthroat trout can appear similar, it is important for anglers to learn how to tell them apart to avoid keeping fish that need protection. For help learning how to identify the trout in Panguitch Lake, refer to page 40 in the Utah Fishing Guide or download an identification guide. TIPS FOR RELEASING FISH IN THE SLOT (15 to 22 inches): If a fish swallows the hook, please cut the line to avoid mortality. A fish can pass a swallowed hook and survive, while digging the hook out will almost certainly kill the fish. Also try fishing with single hooks instead of treble hooks. See the current year Fishing Guide for latest regulations. Spincast, spinning, baitcast, or fly tackle can be used successfully on this water; providing angling opportunities for the novice and the specialized angler alike. Light weight to medium-light tackle is suitable for all fish you will encounter at Panguitch Lake. Sinking line is recommended when fly fishing from a tube. Suggested Bait - Cut bait from legal species, live crawfish (from Panguitch Lake only), salmon eggs, night crawlers, waxworms, or mealworms will provide bait anglers with great action. Suggested Lures - Retrieve or troll small spoons, spinners, and crankbaits for successful lure fishing. Soft plastics (tubes, curly-tail grubs) tipped with cut bait (shiner, chub, sucker) also provides good action. When trolling also try pop gear and a worm or traditional lures like wedding rings or needlefish. A fly and bubble combination will also provide good action.